Though the end of winter is near, it is these last few months that can be the hardest to get through. Spring can seem so close, yet so far away. Our conservation areas have a lot to offer in every season, and especially in winter. To ensure a proper farewell to Alberta's longest season, please read on! Trails maps and directions to our conservation areas can be found here. Glory Hills has some beautiful, groomed cross country ski trails around a lake. Our local steward graciously maintains the trail for others to enjoy. There’s a bit of a downhill hike from the parking area (about 10 minutes) to where the groomed trails begin. As you ski, you’ll likely see a few of our bat boxes as well! All of our conservation areas (except Coates and Lu Carbyn Nature Sanctuary) are great for snowshoeing or winter hiking. If you want a nice view of an oxbow lake, we recommend Pipestone Creek or Larch Sanctuary. Depending on how much snow has fallen, you might want to take your snowshoes, or rent some from Mountain Equipment Co-op or Totem Outfitters. If you love geocaching, we have a bunch that you need to log. If you don’t know what geocaching is and want to know more, check out Geocaching.com to get started. Its like a global treasure hunt! We have geocaches hidden at Pipestone Creek, Hicks, Glory Hills, Ministik and Golden Ranches. If logging geocaches isn’t your thing, try birding or winter wildlife tracking, and photograph your findings. Bring a pair of binoculars and you may be surprised at what you'll see. You are likely to spot chickadees, sparrows, a pileated woodpecker, or even a flock of bohemian waxwings. You'll also likely see tracks from snowshoe hare, deer, coyote, fox, squirrel, and moose. You can find a Winter Wildlife Tracking guide here. If you've ever had the chance to spend a night away from city lights and looked up at the clear night sky, you may have been amazed at how many stars you could see. Most of our conservation areas are located outside of the city and therefore are great for stargazing. If you’re lucky you might even see the elusive aurora borealis. Did you know that you can receive email notifications when there is a high probability that you’ll see the aurora borealis? 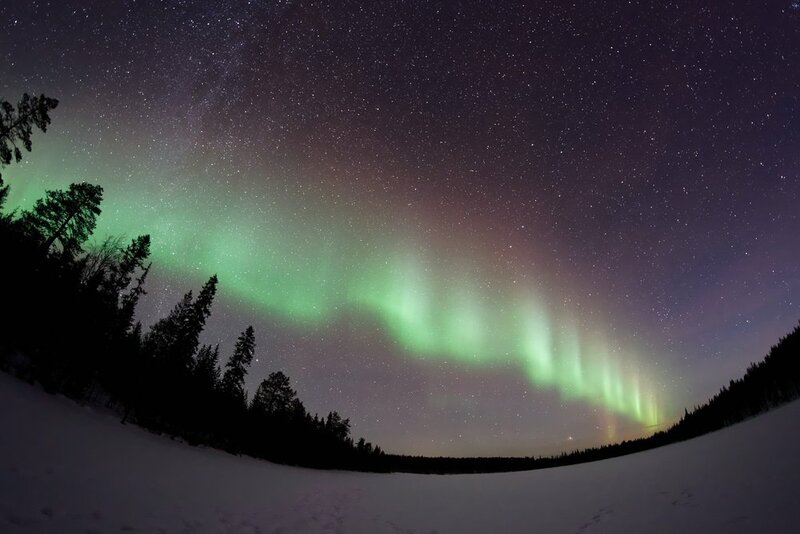 Check out Aurora Watch and sign up for the email notifications. If you do visit one of our conservation areas and take a photo, please post it on social media and tag us (@edarealandtrust) and use the hashtags: #EALT and #YEGTreasures. *None of our conservation areas (except Bunchberry Meadows) have washrooms, so ensure you’ve gone before you head out or find your privacy behind a tree!